The Pain and the Great One return in the 2008 Cool Zone with the Pain & the Great One. (Judy Blume's first Pain and Great One chapter book, Soupy Saturdays with the Pain & the Great One, came out in 2007.) This time the brother and sister duo face bullying at school, the dreaded school bus, name changes, pet show and tell, and art class. 'I'm glad to hear that,' Grandma said. 'But no one ever gave me a magnifying glass from the science museum,' the Great One told her. 'Did you ever ask for one?' Grandma said. 'Well, that explains it,' Grandma said. 'Now I know what you'd like for your next birthday.'" Any child with a sibling will recognize the truth in this conversation. 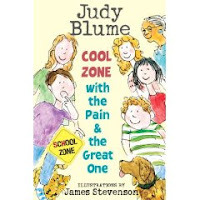 Cool Zone with the Pain & the Great One is highly recommended for anyone with a sibling (or anyone who wants to rejoice in being an only child), anyone in elementary school, and anyone anywhere who enjoys a good story and great narration. Enjoy.